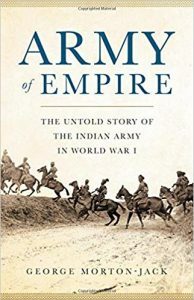 Army of Empire: The Untold Story of the Indian Army in World War I by George Morton-Jack. It tells an often untold piece of history of the then British Commonwealth’s involvement in World War I. Unfortunately, most of the voices in the book come from British officers because unless an Indian was an officer the likelihood of a soldier being illiterate was high. Then there is the racism that these soldiers faced under British command. For instance an Indian officer very rarely had the respect of a fellow British officer. And for those soldiers who were poor, the strong desire to change their circumstances back home such as gaining land for enlisting after the war or extra funds for long military service made enduring racism worth it. Other Indian soldiers got medals like the Victorian Cross for acts of courage in battle such as successfully spying in enemy territory or for saving a fellow wounded soldier. And, this is how they gained respect and status from the British. And for still other Indian soldiers stationed in France, they got a taste of respect as human beings. Some of the soldiers found temporarily love or more lasting love and became husbands and fathers. As well as picking up and learning a whole new language. Army of Empire is full of history like this and much more. If you or someone you know enjoys reading history including military history; this is a great book to read.